You've just run a crawl, which finished successfully. However, when you look at the analyses, many of the graphs and charts are empty. Here's what probably happened and how to fix it. Graphics may be empty if they have no applicable data. 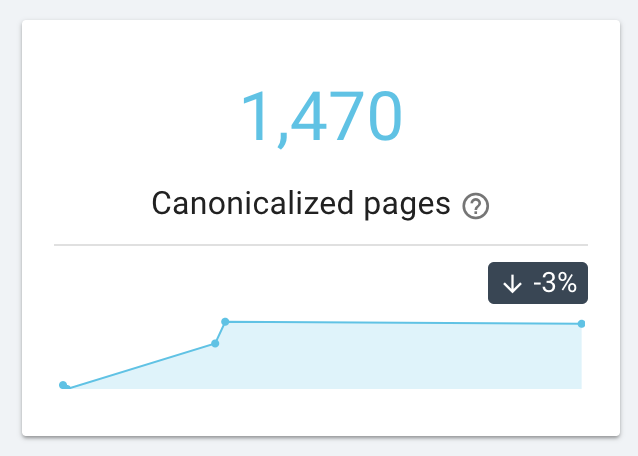 If all of the pages in your website have a non-matching canonical, this can happen even for graphs that seem pretty basic, like the "Page groups by depth" graph above. In this case, every single page will been treated as if it isn't the page you wanted information for. No pages are left to put on a graph. This is a good thing to know. Why? Because if the OnCrawl bot can't find canonical pages to list for your site, the Googlebot can't find your pages, either. To fix empty graphs, you will need to make changes to your website in order to give a bot data for the pages that should show up on a graph. First, confirm that the problem really does come from an issue with canonicals. To check this, head over to the OnCrawl Data Explorer, under the "Tools" tab in the sidebar of the analysis results. This will find all of the pages for which the canonical URL is different than the URL the bot requested. For the pages in this list that you want to be crawled and indexed, you will need to modify the canonical value in the page's HTML. Once you have made these modifications, run another crawl. Your graphs should no longer be empty. If you still need help, drop us a line at @oncrawl_cs or click on the Intercom button at the bottom right of your screen to start a chat with us.